We have a lovely white blanket of snow on the ground now. It has even lasted for more than a few hours! For many moons, we have not had a snowstorm like what we experienced a few days ago. I mean, it was no blizzard. Not even close. But it snowed pretty much all day long. My heart sank for awhile when, late in the morning, the snow turned over to freezing rain. I thought to myself…well, here we go again. Another classic southern Kentucky snowstorm. Blah. But, to my great relief, the snow started falling again. So white. So pure and fresh. So quiet. I think the quiet is what I love the most. So. Our internet connection has been sketchy for the last couple of months. We didn’t have any service during the snowstorm, which was no big surprise, but we’ve been having issues for a lot longer than the duration of the storm. Given where I live, and given the distance the internet line has to travel to reach my house, and given the terrain over which said line must travel, I find it pretty miraculous that we can ever even get online. But we can. And we do. And I think kind of like a lot of other folks that I know (and don’t know), an internet connection has become a component of day to day life that might, just might, be a tad taken for granted. Except when it just won’t work. Then the frustration sets in. For me, the frustration isn’t so much not being able to get on the internet. The frustration comes when I realize my own increasing dependence on the computer/internet that I have come to possess. Even me, in my remote cabin in the woods. I guess I don’t really like feeling a dependence on something so obscure and intangible. Something that doesn’t put supper on the table. Something that doesn’t have a smell or a taste. Something that doesn’t add another log to the woodstove when necessary. But, darn, if it isn’t an incredibly valuable tool when used as such. And I think here lies the conundrum lots of us face as we try to navigate our daily dosage of the world wide web. For a couple of months, we have endured being booted offline at random and disregarding whatever important task was at hand. Just suddenly, bye bye. Our process of regaining our connection developed into a strange series of steps, kind of like an awkward and uncomfortable dance between strangers. Reboot the modem. Restart the computer. Put the computer to sleep at just the precise moment. Etc. Etc. What worked one day may or may not work the next. Finally, it was agreed, we would call the phone company. We were paying for the service after all. Within the hour of placing our call for help, some real nice fellas from the phone company arrived on the scene. They didn’t even squirm when I showed them the steps up to the loft of our cabin. The steps that they would have to climb in order to reach our computer. (If you’ve not been here for a visit, our “steps” consist of wooden pegs sticking out of a spiraling tree trunk. Maybe slightly intimidating for the uninitiated.) Anyhow, the real nice fellas found that, indeed, the line from our outdoor kitchen to our house had a fault somewhere along the way, and needed replacing. A few days later, the real nice fellas came back on the scene with a trencher and new cable and in short order, we were back in business. At least the internet line was back in business. Our computer, on the other hand, was feeling fatigued from it’s tumultuous relationship with the internet and is currently on (hopefully) temporary hiatus until it recovers (aka Eric’s brother fixes it for us). In the meantime, good friends came to the rescue and loaned us their laptop. This entry was posted in cher's posts and tagged computers, farming, internet, life, snow, snowstorm, winter by cher. Bookmark the permalink. Great photos! I’m with you in trying to figure out the internet conundrum. As much as I talk bad about it, I want it when I want it! Yes, I love Chloe! She’s so beautiful. My milk cow and her calf are Jersey. They have a very dark brown hides instead of the classic fawn color. And, yes, the wind! 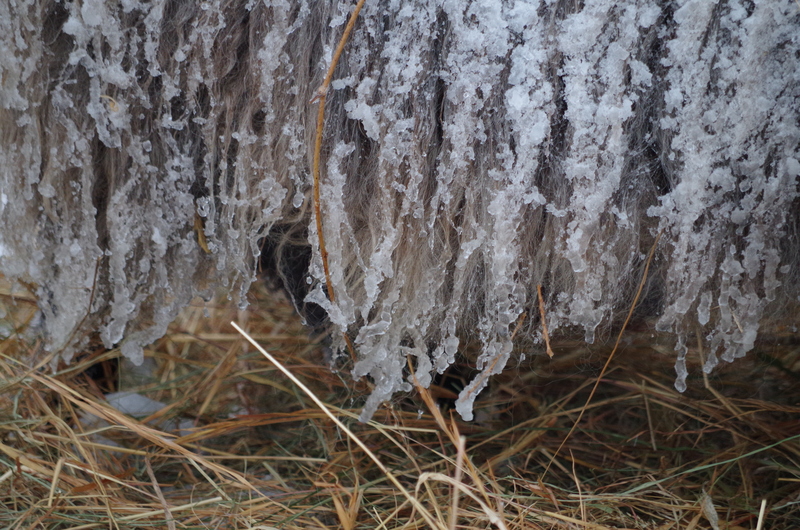 It has been pretty brutal, but the wool sheep don’t seem the least bit phased. This evening when Eric was putting out hay, they were frisking about, jumping up on the bale, and having a grand time. 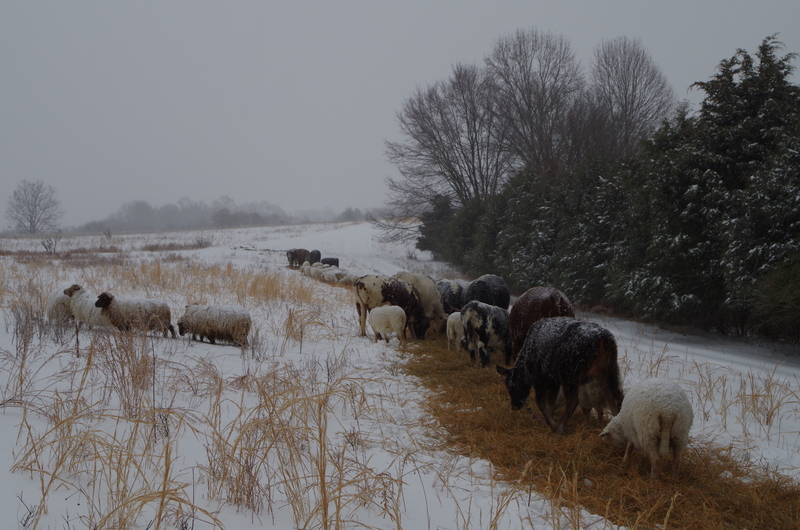 We have the livestock amongst a very thick cedar hedge and in a low depression where they are nicely protected from the wind. We aren’t in the situation to have to consider such things very often! 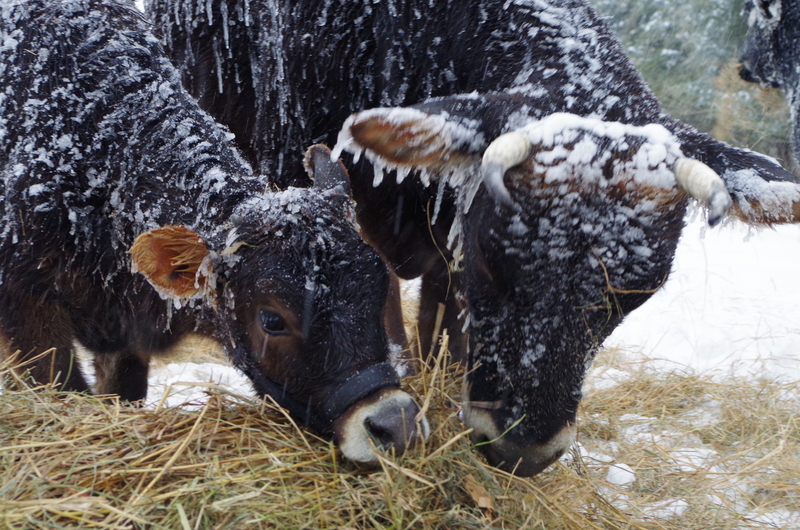 We’ve been down to -10F and -8F the last couple of nights with strong winds. The sheep are fine but making the hay disappear like never before. I simply keep as much in front of them as they’ll take in. 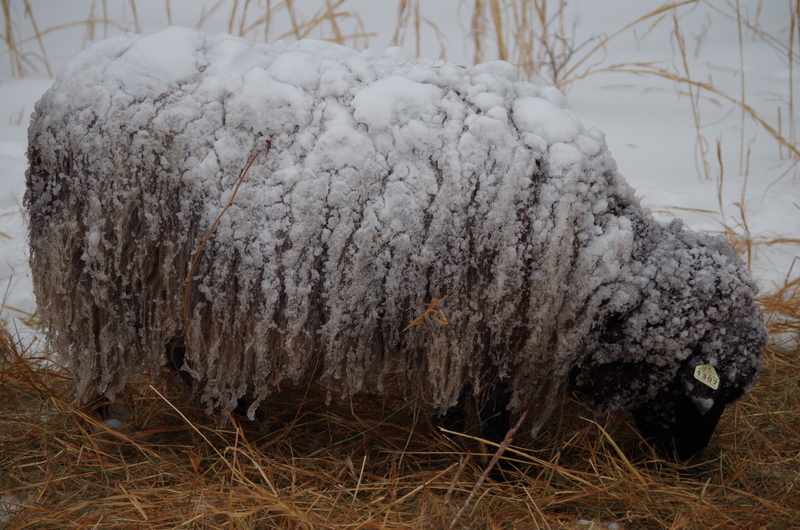 We have problems, at times, when the snow gets taller than the average sheep belly hangs above the ground! When the white stuff gets too deep we have to shovel pathways to the water! Hang in there … spring is coming … I promise.